Josephine Jones, 90, of Loogootee, formerly of Shoals, passed away at 3:50 p.m. Friday, August 3rd, 2018 at Loogootee Nursing Center. She was born June 26, 1928 in Martin County, Indiana to the late Homer H. and Naomi (Qualkenbush) Jones. Josephine attended Quinn School – Lost River Township through the 8th grade. She retired from Perfect Fit in Loogootee at the age of 83 after working there for 37 years. She was an avid seamstress, made her own clothes and did many sewing and mending projects for others. She also did washing and ironing for many families when her children were young. She made blankets for Ronald McDonald House and Riley Children’s Hospital and sold blankets and donated the proceeds to charities. She also made blankets one year for the Loogootee Post Prom. She was a member of the Shoals Christian Church. She taught Sunday School for 50 plus years and had 57 years of perfect Sunday School attendance. She was a member of the Martin County Saddle Club for many years. Josephine’s life was dedicated to taking care of her family. 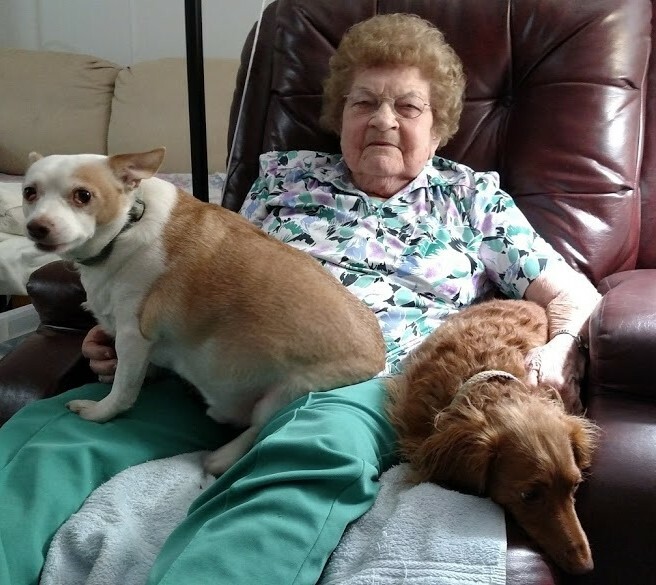 She loved her children, grandchildren, great-grandchildren and she especially loved her dogs. She enjoyed planting and caring for her flowers and riding ATV’s. She liked attending the auctions held once a year at the Bateman School House. She was preceded in death by her parents, Homer H. and Naomi (Qualkenbush) Jones; siblings, Freida McDowell, Gledia "Jean" Newell, Hayden Jones and Virginia "Jenny" Harper; former husband, Benton M. Jones; step-mother, Bertha Jones. Josephine is survived by her children, Rudy Jones of Shoals, Trudy (Mike) Sutton of Loogootee, Brent (Joan) Jones of Troy, TX and Rod Jones of Loogootee; grandchildren, Cassidy (Tyler) Dages of Loogootee, Eric Jones of Rogers, TX, Joshua M. Jones of Shoals and Shaun (Viktoria) Sutton of Wichita, KS; great-grandchildren, Jase and Braeden Dages, Kelsey and Avian Jones and Anna Elizabeth Sutton, due August 26; brother, Lester Jones of Columbus, OH and special dogs, Porky, Sadie and Marley. Funeral services will be conducted at 10:00 a.m. Friday, August 10, 2018 at the Shoals Christian Church. Burial will follow in Waggoner’s Chapel Cemetery. Visitation will be held Thursday, August 9, 2018 from 4:00 p.m. to 7:30 p.m. at Blake Funeral Home in Loogootee and Friday, August 10, 2018 from 9:00 a.m. until the time of service at the church. In lieu of flowers memorial contributions can be made Waggoner’s Chapel Cemetery, c/o Betty Butler, 226 Miller Street, Shoals, IN 47581.